Luxury and Beauty on your relaxing Lanai. The home you have dreamed of for an incredible price! 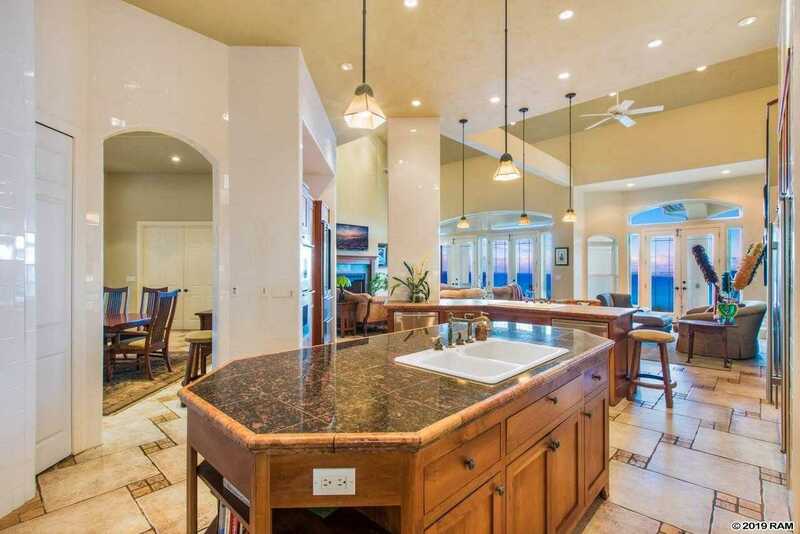 This luxury home is nestled in the West Maui Mountains above Wailuku. Take in one of the most incredibly scenic drives in Maui as you enjoy the sweet Ocean breeze. The privately gated community of Maluhia Country Ranches is like nowhere else in Hawaii. This gorgeous estate, in one of the most exclusive neighborhoods on Maui, mixes the perfect blend of seclusion with convenience and practicality. You are only a 15 minutes scenic drive from the County seat of Wailuku and shopping, and a short 25 minutes to Mauis international airport. This superb home has approximately 7861 square feet under roof including outdoor living spaces for entertaining. There is 6085 sf of living space on this extraordinary property, including a detached 2- bedroom 1 bath Ohana and a separate and detached Mother-in Law unit. From the moment you escape to this incredible luxury home and gasp at the truly breathtaking views, you will fall in love with this magnificent property. This gated and private estate is a masterpiece of design and craftsmanship featuring inlayed travertine floors, exotic Santos mahogany wood floors and intricately hand-crafted cherry wood cabinetry. This private manor is a sophisticated and luxurious retreat that reflects a magical merging of inspiration and architecture. Every detail was carefully selected and quality crafted. The stunning top-of-the-line chef's kitchen is clad with premium finishes and fixtures including professional-grade appliances and an expansive hidden away butlerâs pantry. Sprawling entertainment spaces with 23-foot vaulted ceilings flow outside to the massive outdoor living areas. The 2-story great room with its French doors to the rear reveal a panoramic 270-degree unobstructed view of Haleakala, the emerald green West Maui mountains veiled in beautiful waterfalls and the caerulean blue Pacific Ocean. This dramatic focal point of the main level is accompanied by an elegant formal dining room with gorgeous built-ins hand crafted in select American cherry wood. The 3,864-sf ground floor level of the main house features an immense master suite with a formal bath unsurpassed in elegance and style. His and hers walk-in closets round out your private space designed with every comfort in mind. Down the hall past the laundry room and two perfectly appointed and substantial bedrooms, each with its own walk-in closet, you will enter the large home office with its private bath. Adjacent to the office is the double door entry to the expansive home theater where every attention to an extraordinary entertainment experience has been thought of. This horse loverâs paradise is beautifully landscaped with striking and wonderfully designed gardens with many fruit trees and exotic tropical flowering plants. When you approach this stunning property, you will be greeted by a gorgeous ivy covered Keawe arch. Enjoy unsurpassed whale watching from 3 beautiful private acres overlooking some of the finest ocean vistas on Maui. Escape the hustle and bustle of the normally crowded resort areas and make your home in one of Mauiâs most serene and peaceful locations. Donât miss this opportunity to own this very special piece of paradise. Hurry and schedule a viewing. Please, send me more information on this property: MLS# 381686 – $2,500,000 – 15 Lahaole Pl, Wailuku, HI 96793.